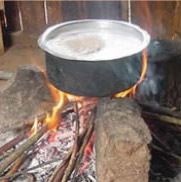 Welcomes you to explore the wonderful and colorful cuisine of Kenya. please note that there may be a slight difference in the prices on our take away menu and groups menu. If you have any questions please don not hesitate to contact us. To avoid disappointment see full details and conditions on our promotion page. Our promotions are only valid if you reserve via our website, mail@3stones.info or calling 070 360 8761. Reserve at least a day in advance with the appropriate promotional code. Please contact us for more information. * BIG5 Saturday = Drinks on the House! * Eat for FREE on your Birthday! To avoid disappointment see full details and conditions on our promotion page.